Each week, Big Issues focuses on a newly released comic book of significance. This week, it’s The Unwritten: Apocalypse #1. Written by Mike Carey (X-Men: Legacy, Lucifer) and drawn by Peter Gross (Lucifer, The Books Of Magic), this issue is an exceptional introductory point for new readers, which showcases the title’s metafictional storytelling by giving the lead character a new beginning. Warning: spoilers ahead. From the very beginning, The Unwritten has been about blurring the lines between fiction and reality. The central character is a man who discovers he’s actually the Harry Potter-like boy wizard he believed to be a fictional creation of his novelist father. Since that initial revelation, the book has spent 59 issues exploring the world of literature, while philosophizing on the nature of artistic conception. Once a story is born, it’s alive and has the capacity to change far beyond the author’s intent depending on the circumstances of its telling. Cultural shifts and advances in literature give readers a new context for these stories that the authors could never have predicted. To argue this idea, writer Mike Carey and artist Peter Gross created Tom Taylor—a hero who knows he’s the “real” version of a fictional character—and littered Tom’s journey with figures and situations from classic literature, with a particular focus on American and European fiction from the 19th century to present. The last storyline of The Unwritten found Tom coming face-to-face with the cast of Fables, a crossover that ended with Tom embracing his fictional identity of Tommy Taylor and blowing the magic horn from his father’s story, an instrument with the power to unmake the world and rebuild it from scratch. With the sounding of the horn, Tom is also reborn, and in order to get back home, he has to traverse various fictional worlds in The Unwritten: Apocalypse #1. While that probably doesn’t sound especially new reader-friendly, it’s not necessary information to understand and enjoy the first issue of this miniseries, which concludes Carey and Gross’ magnum opus over 12 chapters. In the current comic book industry where relaunches and new #1 issues are all the rage, it’s understandable why Vertigo is debuting a new volume of The Unwritten to bring added attention to the title for its grand finale, and the creative team wisely uses this issue to tell a self-contained, hugely imaginative story that gives new readers plenty of reasons to seek out back issues and collections. It’s a concentrated dose of everything that has made this book memorable, a visually striking and philosophically complex metafictional fable that uses classic stories to dissect the relationship between reader and text. The Unwritten: Apocalypse #1, titled “Bestiary,” starts at the beginning of all things, when the universe was unorganized matter governed by entropy. That primeval soup explodes into life, and, as Carey writes, “The thing about life—is that it’s a text. It contains its own story, in the form of endless loops and spirals of protein. It’s like every living thing is a book, and every letter of every word on every page is the full text of the book written in a smaller font.” That observation is the foundation of Carey’s story, drawing a connection between the genetic building blocks of life in the real world and the text that creates worlds in fiction. Now that the hypothetical new reader has a concept of the book’s central theoretical idea, it’s time to show that concept in action by taking Tom on an existential journey through various classic stories on his way home. Tom’s rebirth in this issue is captured by having him travel through settings based on seminal children’s stories, beginning with Aesop’s Fables and ending with Willowbank Wood, this title’s analog for the copyrighted Hundred Acre Wood of A.A. Milne’s Winnie-The-Pooh. Tom begins as a lowly insect visiting Aesop’s “The Ant And The Grasshopper,” then becomes Hans Christian Andersen’s Ugly Duckling, a snake in Rudyard Kipling’s “Rikki-Tikki-Tavi,” and a mouse in Lewis Carroll’s Alice’s Adventures In Wonderland and C.S. Lewis’ The Lion, The Witch And The Wardrobe, before entering Aslan’s body and getting sacrificed on the Stone Table. After dying as Aslan, Tom awakes in his human body, completing his revival just in time for him to return to a home that has been ravaged by apocalypse in his absence. Tom has always been a stand-in for the reader, a “real” person who suddenly finds himself a major player in fictional stories, and his extraordinary abilities are a metaphor for what the imagination does every time someone picks up a book. The final story is a collaboration between the author/illustrator and the reader, with the author’s words and the illustrator’s visuals serving as the DNA for a living world the reader creates in the mind. These are ideas tackled by decades of postmodern literary theory, and it’s easy to see the stacks of college essays that will be drafted on The Unwritten after Carey and Gross finish the comic, with new writers adding to this world as they apply their personal opinions to the narrative. During Tom’s journey this issue, new readers are given the necessary exposition to move forward, while being treated to immersive artwork that switches styles to make each new world feel like a wholly distinct environment. 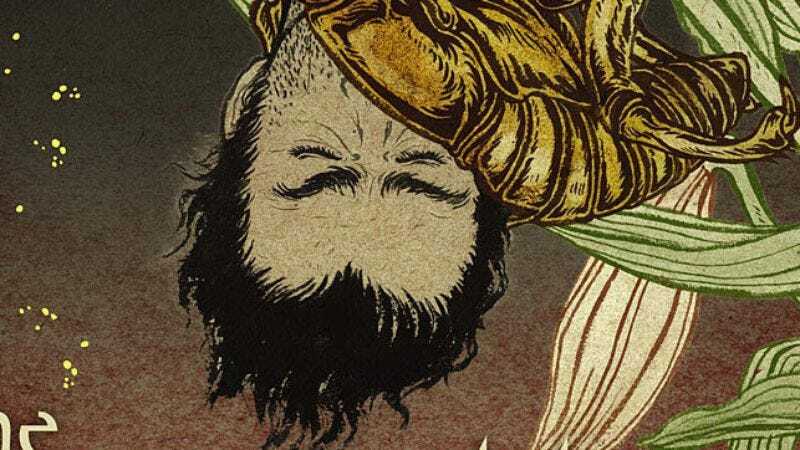 The Unwritten is one of the most visually consistent comics being published, with breathtaking covers from Yuko Shimizu and incredibly versatile interior artwork from Gross, who pulls from a variety of illustrator influences as Carey pulls inspiration from different authors. For the entirety of the book’s run, Shimizu has done exquisite work creating eye-catching pieces of art that simplify the complex ideas of each issue with symbolic, ethereal imagery, and his cover for Apocalypse #1 is a stunning example of his massive talent. With an ominous silhouette of London in the background, the cover shows a golden cicada climbing a flower, pollen falling like pixie dust as Tom’s head emerges from the cicada’s shell. It’s a mesmerizing blend of organic beauty with traditionally apocalyptic imagery, placing Tom’s glorious metamorphosis within a horrific context. This issue is one of Gross’ greatest achievements on the series, juggling an array of illustration techniques to evoke a different atmosphere for each new world. For Aesop’s world, one built on an oral tradition rather than a concrete text, Gross uses a sketchy style that keeps the blue linework as the base for more detailed inking. The reader can see how the art changes from Gross’ initial sketches to the final product, a very clever way of visualizing how the worlds of these simpler stories passed down orally over time are less defined than works where the original text is readily available. The artwork becomes cleaner once the issue moves into the works of Andersen and Kipling, and in the case of Carroll’s, Lewis’, and Milne’s worlds, Gross pulls from the work of illustrators that are synonymous with those creations, making each world a pastiche of the works of John Tenniel, Pauline Baynes, and E.H. Shepard respectively. Chris Chuckry’s coloring and Todd Klein’s lettering similarly adjust with each new environment, making each scene a unique visual representation of the source material. Jumping in at the end of an ongoing series may not seem like the wisest decision, but it’s likely that newcomers to The Unwritten will want more after absorbing this issue. As the Mad Hatter tells Tom, “If you find yourself in the middle of a story, then of course you must continue to the end. Or the beginning.” The Unwritten: Apocalypse #1 gives new readers the tools to move in either direction, and no matter which way they decide to move, they’re in for an unforgettable adventure.